The Supermaterial That Could Make Plastic Obsolete Is... Mushrooms? Fungus is, almost universally, not a good thing to have in your walls or personal belongings. And normally, selling certain strains could lead to federal charges. But a company called Ecovative is violating both of those rules, creating packaging and building materials from fungus—and they’re being lauded as visionaries for it. Ecovative was founded by Eben Bayer and Gavin McIntyre, who started experimenting with fungus as part of a school project. Today, they employ 60 people and maintain a massive facility in upstate New York, where they farm mycelium, the root-like threads that form the basis for fungus. Mycelium is like a glue: it latches onto whatever it finds around it—usually, low-value organic matter like plant stalks or cotton hulls—to create a super-dense network of threads. Ecovative grows it in dark cartons for three to five days, after which they use extreme heat to stop it from blossoming spores. “Spores come from the fruiting body or mushroom,” explains Ecovative’s Sam Harrington. “Since we don't grow the mycelium for long enough to 'fruit' to form a mushroom, there are never any spores or allergen concerns with our process." Ecovative's process is transformative in two ways. First, there's the unique biological properties of Mycelium, which can grow miles of thread-like roots in days. It's an incredibly speedy organism, which makes it ideal for manufacturing. Then there's the fact that it grows to fit any mold, almost like a dense foam. Ecovative grows everything from finely detailed packaging for laptops, to wide panels of insulation for homes. They're also able to control the density of each product, simply by stopping the growth process sooner or later. Their latest experiment? Growing Mycelium architecture. This month, they unveiled what they call Mushroom Tiny House, a small gabled cabin whose interior walls are packed with Mycelium insulation. “We see a future where Mushroom Materials are found in the bumper of your car, the walls of your home, and inside your desk,” says Harrington. The biggest challenge with scaling their burgeoning fungus operation is likely the public perception of its products. Organically-grown packaging is usually seen as coup for companies’ marketing teams, but it’s less so for those on the logistics side of things. Still, that’s rapidly changing. 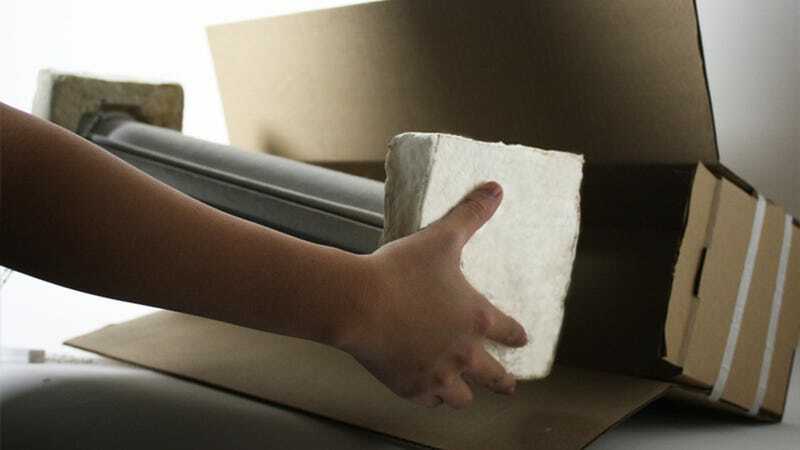 This year, Ecovative is partnering with Sealed Air Corporation, the 50-year-old company that invented bubble wrap, to open a factory in Iowa where they'll scale their packaging output. They’re also in talks with several electronics makers to grow Mycelium packaging for laptops and tablets. "We have tested these materials in environmental chambers under extreme conditions as well as several years of shipping packaging and we have not found mold to be an issue at all," says Harrington. Harrington, tellingly, situates Ecovative as the latest in a long line of great American chemical and materials giants. “Dow and Dupont spent the last 100 years turning petroleum and natural gas into all sorts of amazing plastics and materials,” he says. “[But] usually with not so amazing environmental consequences. We aim to be this centuries leader in sustainable materials.” Companies like Dow and Dupont have past hundred years developing chemicals to prevent mold. Now, Ecovative is poised to spend the next hundred years encouraging it.